Hannah Genders introduces a special project celebrating our county’s fruit-growing. The wonderful author and lifelong environmentalist Roger Deakin (people may know him from his books Waterlogged and Wildwood) was also a key person in setting up the Common Ground movement in 1982. Common ground, which is still going strong, is all about connecting people with their local landscape, recognising the local diversity we have in the UK and celebrating it. For example, here in Worcestershire we are blessed with some of the best growing land in the whole of the country and what it grows particularly well are apples and fruit. Our local Worcestershire apples include the well-known Worcester Pearmain, a small, red eating apple dating back to 1870, but there are countless others – like Pitmaston Pineapple, which produces only small apples, but they are very sweet, almost honey-flavoured. The cooking pear Worcester Black is featured on the Worcestershire coat of arms. As I now live in the Lenches, just north of Evesham, an area with many orchards, each year we have a blossom trail where people cycle or drive round to admire the orchards in full blossom. But as many of you will know, these precious orchards are falling into disrepair, becoming overgrown and neglected so they don’t produce as well as they should, and for those that do produce the problem is finding enough labour to pick and use the fruit. This is where the whole idea of “community orchards” comes into play. Many of these orchards up and down the country are being taken over by groups of people (volunteers) who recognise their significance to our local history and their value in producing food and are doing something about it. One thriving group I met up with recently is Colwall Community Orchards, on the west side of the Malverns. 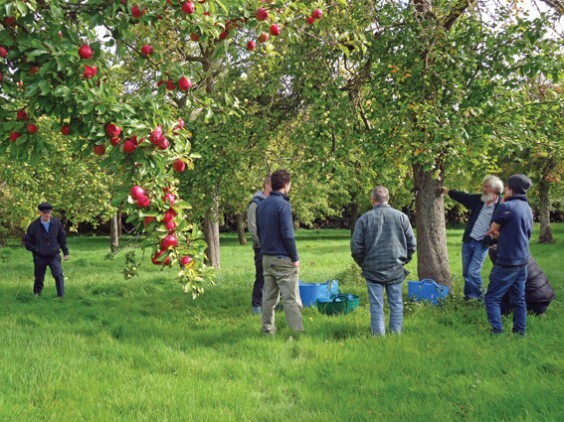 The group, headed up for the most part by Tim Dixon, bought the orchards in 2011, at which point it was just a field – but according to research it had previously been an orchard, known as Gas Orchard. There was a thriving fruit-producing business there and an apple shed which went out of business in 1961 – about the time that landowners were being paid to grub up these orchards and the mass imports of apples were starting. It is thought the orchard was originally planted in 1900. So, from a bare field, the group have come together and to date planted 244 trees, all varieties from the local counties of Worcestershire, Herefordshire and Gloucestershire. They have also planted 47 fruit trees in the hedges around the site. The orchards surround a sunny open area which has been developed for allotments, so members from the village can come together and grow their own food. The allotments are all part of the community project, and the orchard project bought the land which is about seven acres, so the site is secure. There are around 60 allotments altogether, although many of them are not the full allotment size that you would find on a council allotment site – and this seems to me an excellent idea, as many of the full-sized sites are way too big for people to manage. There is a strong emphasis on it being a fun site, with lots of social events and community events as well as teaching sessions in their newly-refurbished apple shed which they managed to get a grant to restore. There seems to be so much going on here and it ticks so many boxes: producing local, sustainable food, addressing the issues of loneliness in our society, getting fit and being outdoors. What’s not to love? This wonderful group of people, along with other community groups who are growing food, providing local green energy, rural eco-housing, and live music, will be part of my Eco, Green and Growing feature at the Malvern Spring Festival this year. The show runs from May 10–13. There will be opportunities to hear the story of this orchard and all their plans for the future, along with many others, so come and be inspired and say hello. As I started by telling you about Roger Deakin, I wanted to finish with an interesting story. The person who got him into loving wildlife was a science teacher, who asked Roger and his friend to measure how deep a great diving beetle could dive down in their school pond. A simple task, but one that got him hooked and helped him fall in love with the natural world. It reminds me of how important it is to help our children and grandchildren engage with nature. For more information about the Malvern Show see http://www.rhsmalvern.co.uk/whats-on/grow-know (please be aware that ticket prices vary on different days).